Well Done Bart!!! Another huge challenge completed! 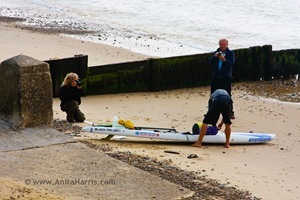 100miles across the English Channel on an SUP board. A stand up paddle board! 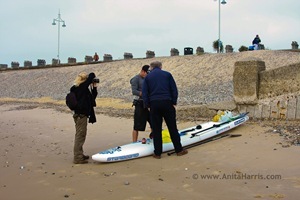 He began his crossing at South Beach in Lowenstoft in the UK and reached dry land in Zandvoort in Holland after what must have been a gruelling 39 hour crossing. His arrival at Zandvoort was to crowds of waiting friends, relatives, and the media – it was late last night at 1am on the 1st of June 2012 when he did finally arrive, after hours of anxious waiting. I was invited to be their ‘official’ photographer on the UK side and took the following photographs of his departure in the foggy (and sunny) UK, and there are many new photos now of his arrival all across the internet, and on Barts blog – see links below the photographs. Barts home is in Maui, Hawaii, and the Maui News are going to publish his ‘Ultimate crossing’ story tomorrow, as I am sure other newspapers from Europe will too. WELL done Bart- you’ve done amazing..
Barts Ultimate Challenge Blog – For info after the 39 hour/100miles “North Sea” crossing!